On Friday, Sept. 7, at 11 a.m., in the Pekin Public Library Community Room, the library will have a showing of a video about Pekin trains, featuring footage of the old Chicago & Illinois Midland Railroad. The video, which is about 30 minutes in length, is a part of the library’s Illinois Bicentennial Series. During the first few decades following Illinois’ admission to the Union in 1818, the new state’s growth in population and wealth was in large part driven by steam power. Initially, as indicated in last week’s From the History Room column, men and goods were transported along the waterways and canals of Illinois using riverboats, whether steamers or packet boats. But steam-powered rail (invented in Britain in 1804, three years before Robert Fulton’s first steamboat) would soon challenge and then eclipse steamboats as the preferred means of long-distance transportation of good and people. While Illinois’ steamboats were restricted to rivers, railroad tracks could be laid across long stretches of country, crossing rivers and streams and even climbing through mountain passes. Pekin’s pioneer historian William H. Bates told of continued efforts to get a railroad line to Pekin in his narrative of Pekin’s early history that was included in the 1870-71 Sellers & Bates Pekin City Directory. The following excerpts from Bates’ narrative demonstrate that Pekin’s city officials were willing to commit great sums of public funds to railroad projects, which were necessarily massive and expensive undertakings. “On the 4th day of July, 1859, the first rail was laid and the first spike driven on the prospective Illinois River Railroad. This was a gala day, full of momentous events for the future, and the birth-day of unnumbered hopes and anticipations yet to be realized. The leading citizens participated in celebrating the new enterprise on such an auspicious day as the Fourth of July. Not only because it cost so much to build and operate a railroad, but also due to the interruption of the Civil War, most of Tazewell County’s railroad companies did not become fully operational until the latter 1860s. What had begun as the abortive Pekin & Tremont Railroad Company in Jan. 1835 later was taken up as a part of the Indianapolis, Bloomington & Western Railway in Aug. 1869, a road that stretched 202 miles from Indianapolis to Pekin (later being extended to Peoria). Similarly, the Illinois River Railroad Company, whose first spike in Pekin was driven on July 4, 1859, eventually became the Peoria, Pekin & Jacksonville Railroad Company. Chapman’s Tazewell County history includes historical accounts of that company as well as the Indianapolis, Bloomington & Western Railway and five other railroad companies that had lines through Tazewell County: the Chicago, Alton & St. Louis Railroad, the Pekin, Lincoln & Decatur Railway, the Toledo, Peoria & Warsaw Railroad, the Illinois Midland, and the Chicago, Pekin & Southwestern Railroad. The investors, directors, and employees of these railroad companies were among the preeminent men of Tazewell County and central Illinois – such as Benjamin S. Prettyman, Teis Smith, John B. Cohrs, James M. James, Gordis R. Cobleigh, or Columbus R. Cummings. A review of the names on the boards of directors of the early railroad companies will, not surprisingly, show many of the same names showing up on the lists of city mayors, aldermen, and successful businessmen and local attorneys. This is a slightly revised version of one of our “From the Local History Room” columns that first appeared in February 2015 before the launch of this weblog, republished here as a part of our Illinois Bicentennial Series on early Illinois history. On Friday, May 4, at 11 a.m., the Pekin Public Library will present the fifth video in its Illinois Bicentennial Series in the Community Room. As people in the U.S. and Europe observe the 73rd anniversary of “V-E Day” (the surrender of Nazi Germany on May 8, 1945), the video will be “We Were There: World War II.” The video is an Alliance Library System oral history that was filmed at the Pekin Public Library, Eureka Public Library, and Illinois State Library in 1992. Afterwards, the Pekin Public Library’s oral history production that recorded personal memories of the assassination of President John F. Kennedy will be shown. Admission is free and the public is invited. The first election: According to Bates, the first local election took place in August 1826 at the Dillon home, where Nathan Dillon and his kin had settled. 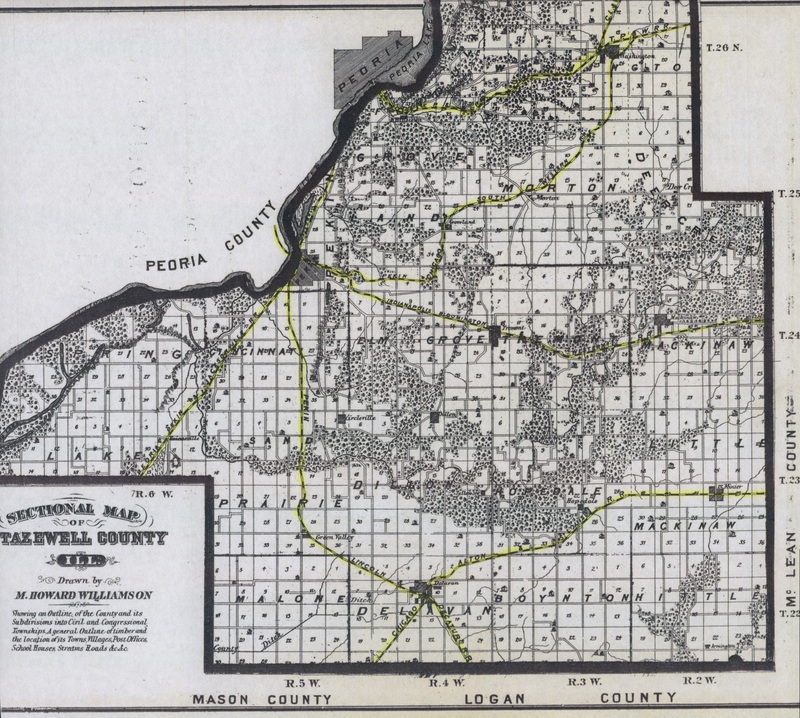 The area was then under the jurisdiction of Peoria County, for Tazewell County was not to be established by the Illinois General Assembly until the following year. “We are not informed who received a majority of the votes nor the number polled, but the day was a gala one and of sufficient importance to be commemorated by a banquet,” Bates writes. The first death: After white Americans began to make permanent settlements in what would become Tazewell County, the first recorded death was that of Ezekiel Turner, who was struck by lightning in February 1825. To make a coffin, Turner’s companions felled a straight walnut tree, cut the trunk in half along its length, and then hollowed out the trunk. The first settler: The first white settler in what would become Pekin was Jonathan Tharp of Ohio, who built a log cabin in 1824 on a bluff above the Illinois River at a spot that today is near the foot of Broadway, not far from where Pottawatomi Chief Shabbona and his family soon after set up their wigwams. The first white child: On March 10, 1827, Joseph, son of Jonathan Tharp, was the first white child born in what would become Pekin. The first steamboat: The first steamboat to visit Pekin chugged up the river early one morning in the late fall of 1828, the never-before-heard noises giving many of the sleepy settlers a real fright. Jonathan Tharp’s father Jacob thought the sounds signaled the end of the world, Bates says. The first church: Pekin’s first church building was erected by the Methodists on Elizabeth Street between Third and Capitol. The Rev. Joseph Mitchell was the congregation’s first regular pastor. The first brick house: Pekin’s original homes were log cabins and wood frame houses, but by the 1830s some settlers began to build brick homes. The first one was the Mark residence at the corner of Court and Second streets. “We are not informed as to the time when it was built, but from the fact that it was raised to its present height in 1835, we presume it was erected as early as 1833,” Bates says. Shown is the home of Pekin pioneer Jacob Tharp, who came here from Ohio in 1825. 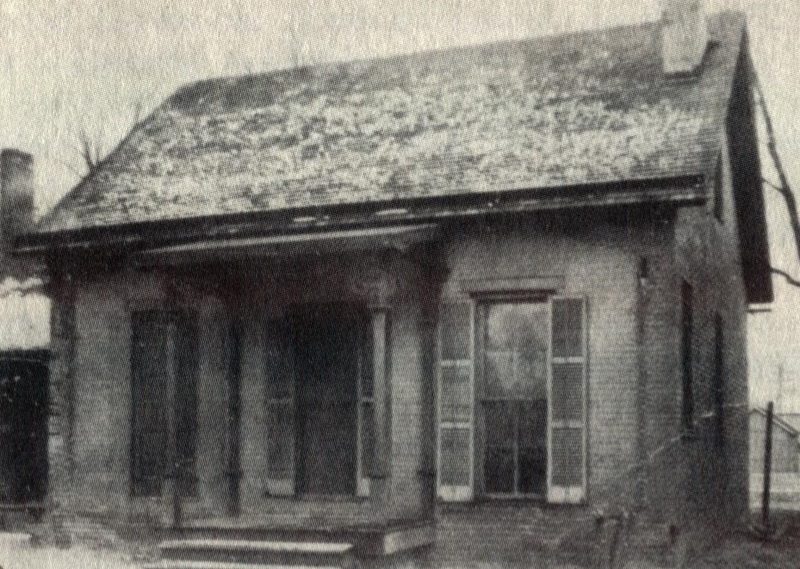 Tharp’s dwelling, located where the St. Joseph’s Parish Center is today, was one of the first two-storey brick houses in Pekin according to “Pekin: A Pictorial History.” According to W. H. Bates, the Mark residence was the first brick house. The first town election: After the establishment of Pekin as a town, the first town election took place on July 9, 1835. Five men were elected as town trustees: D. Mark, D. Bailey, Samuel Wilson, J.C. Morgan and S. Pillsbury, with Morgan being elected as president of the town’s board of trustees. The first town seal: Pekin’s first seal was “an eagle of a quarter of a dollar of the new coinage,” formally adopted by the town board on Dec. 29, 1840. The first steam mill: Pekin’s first steam mill was built in April 1845 by Benjamin Kellogg near the river between Margaret and Ann Eliza streets. Kellogg’s business was destroyed by a fire in the fall of 1849. The first jail: Pekin’s first jail — which Bates calls “the first calaboose” — was built in November 1849 for the cost of $48. The “calaboose” served the city until 1868, when it was destroyed by a fire started by some of its inmates. The story of the America’s rapid and unprecedented growth as an economic powerhouse is tied inextricably to the story of the railroads, which played a very important role in the life and development of the city of Pekin. As this column previously has had the occasion to mention more than once, Pekin was once a thriving hub of the railway industry. Let’s take a look at the kinds of things we can learn from the Pekin Public Library’s Local History Room about how railroads got their start in our city. In Pekin’s case, this is a story with a key event that happened on the Fourth of July. Showing some damage and age, this photograph of the old Peoria, Pekin & Jacksonville Railroad depot — Pekin’s first railroad depot — was taken about 1868 by George Bacon. The depot was built in or around 1859, and stood at the southeast corner of Third and St. Mary streets, now the location of the parking lot behind the Tazewell County Justice Center. Tracks still run past this spot today. The 1861 City Directory says the line was completed as far as Virginia, Ill., and the fare for the 62-mile trip from Pekin to Virginia was $2.25. Regarding the early railroads in Pekin, “Pekin Centenary” comments, “Only a handful of the railroad crossings were actually ‘crossings’; most of them simply blocked the street effectively, buttressed by six foot drainage ditches along the right-of-way,” and also mentions that the Santa Fe railroad used to run afternoon shuttles out to Pekin’s horse race track which was located on the north side of Broadway in what today is 19th and 20th streets. In the Golden Age of Rail, Pekin boasted five train depots. Two of them remain. 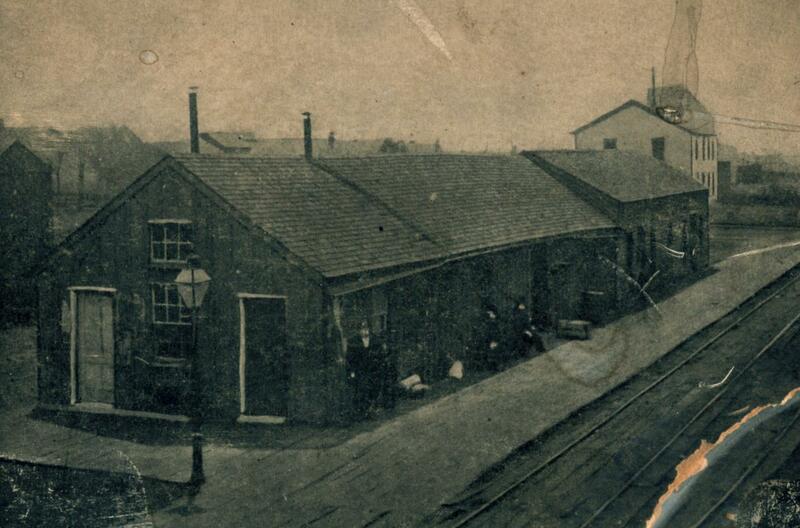 One of them is the depot on Broadway and Third Streets, built in 1873 by the Pekin, Peoria and Jacksonville Railroad. It’s still in use, though no longer as a railroad depot. Last week’s column featured the Civil War discharge paper of William H. Bates of Pekin, a notable item from the Tazewell County Genealogical & Historical Society’s recently acquired Bates collection. Another remarkable document in the Society’s Bates collection is a relic from the early period of the Era of the Railroad – it’s a payroll ledger sheet for the Pekin, Lincoln & Decatur Railway. Bearing the date of October 1870, and browned, creased, and partly crumbling with age, the payroll sheet records the wages paid out on Oct. 15, 1870, to men who worked for the Pekin Railway Construction Company. It’s not clear how this page ended up in the possession of Bates, who was then engaged in the newspaper and printing trades. Charles C. Chapman’s 1879 “History of Tazewell County,” pages 735-740, tells of the founding and construction of the P., L. & D. Railway, but Bates is not named among the men involved in the company, nor do his published biographical essays mention any connection with this railroad. Perhaps he acquired this sheet while compiling Pekin’s history for one of his local publications. Chapman’s account goes to great lengths to stress how important this particular railroad was to the people of Tazewell County. “No other of the several railroads traversing this county seem so closely identified with the interests and history of Tazewell county as the P., L. & D. It is a road in which every one takes a commendable local pride,” Chapman says. The 1873 Atlas Map of Tazewell County traces the railroad’s route south out of Pekin through Cincinnati Township, then through Sand Prairie Township to the west of the lost town of Circleville, down to Green Valley where the road veered east through Malone Township to Delavan in Delavan Township, finally heading southeast out of Tazewell County on the way to Lincoln and ultimately Decatur. The company was chartered in 1867, and its founding members were Benjamin S. Prettyman, Teis Smith, Peter Weyhrich, R. B. Latham, A. M. Miller, John Wyatt, M. Wemple, J. F. D. Elliott, S. C. Bean, Henry B. Durfee, and Luber Burrows. Prettyman was the company’s first president. Subsequently, in 1869, other prominent and wealthy investors joined the venture, including Columbus R. Cummings (founder of the Cummings Estate which donated James Field to Pekin’s public schools), Gordis R. Cobleigh, and John B. Cohrs (whose wife was one of the founding members of the Ladies Library Association, predecessor of the Pekin Public Library). Cobleigh became the general superintendent of the P., L. & D Railway. While Chapman’s account lists the investors and directors of the company whose money and influence made the construction and maintenance of this railroad possible, this payroll ledger sheet provides a list of 26 men who actually did the work of building the railroad, doing the grading work and laying down the ties and steel rails. Most of the workmen were paid at a rate of $1.75 a day or $2 a day, but a few only a dollar a day. The workmen’s names are handwritten, though, and the handwriting is often not easy to make out – not only the names that were written (and often misspelled) by the company staff member who drew up the ledger sheet, but especially the employees’ signatures that testify they had received their wages. Among the names that are easier to make out are Thomas Doyle, John Leitz, John Coakley, John O’Brien, James Simcack (as spelled by the staff member, though the signature looks more like Simpcott), Ubbo Blompot (signed Bloempott), L. Cramar (signed Cremer), Albert Ubben, and D. Sathoff. The Bloempott and Ubben families were German immigrants who settled in the Pekin area around that time, and long-time Pekin residents will recall Bloompott Florist & Greenhouse at the corner of Hamilton and Eighth streets, which went out of business about 10 years ago and is now the location of Trouble Free Plumbing. Next week’s From the Local History Room column will spotlight the contents of one of the old daybooks from the TCGHS Bates collection. This payroll ledger sheet for the Pekin Railway Construction Company, which built and owned the old Pekin, Lincoln & Decatur Railway, lists 26 men who worked on the construction of the railroad in October 1870. This sheet is a part of the William H. Bates collection at the Tazewell County Genealogical & Historical Society, and this image has been graciously supplied courtesy of the Society. Older Pekin residents will remember the old railroad bridge that once spanned the Illinois River just to the north of the old Pekin lift bridge. Both bridges were removed in the 1970s and 1980s to make way for the John T. McNaughton Bridge. The current bridge’s advantage over the old bridges is, of course, that it is high enough to allow barge traffic to pass beneath without regular and frequent interruptions of automobile and rail traffic. 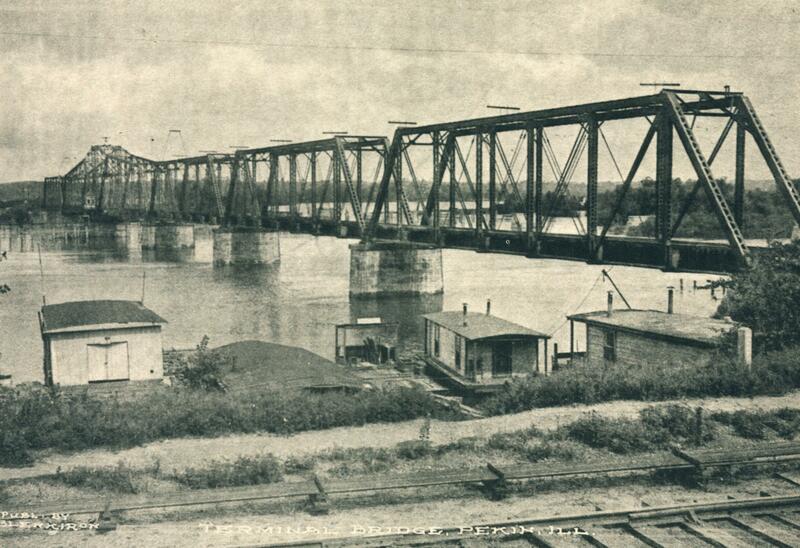 Formerly, when barges had to pass Pekin, the old Pekin bridge had to be raised while the railroad bridge had to use its swingspan to open a passage. While the railroad bridge is remembered by many, probably not many remember who oversaw its construction. Ben C. Allensworth’s 1905 “History of Tazewell County,” page 1030, informs us that Dietrich H. Jansen (1872-1951), Pekin city engineer and Tazewell County surveyor, “had charge of the construction of the Peoria & Pekin Terminal Railroad bridge across the Illinois River at Pekin” in 1899 and 1900. Jansen and his wife Norma later had a second son named Norman Roos Jansen in 1907, when Norma died. Jansen passed away on Oct. 22, 1951, and he is buried in Lakeside Cemetery, Pekin, where his sons, who both died in 1980, are also buried. Over the decades, the Terminal Bridge was struck several times by barges. Among the final collisions was one in the early 1970s that left the swingspan drooping sadly into the river. No longer usable or needed, a few years later the bridge finally was spectacularly dynamited and its steel ruins hauled away as preparations began for the construction of the new Pekin bridge. This vintage photograph shows the old Terminal Bridge at Pekin, a swingspan railroad bridge built in 1899-1900 under the direction of Pekin City Engineer Dietrich H. Jansen (1872-1951).